All our campers have been designed to withstand Chiles tough terrain, ensuring you can confidently tackle whatever nature throws at you whilst subtly blending into the natural wilderness and breath taking surroundings on offer. Compact yet user friendly, both the Condor Explorer and the Condor 4X4 Popup come with Condor Complimentaries as standard to make your journey as cost effective and enjoyable as possible. 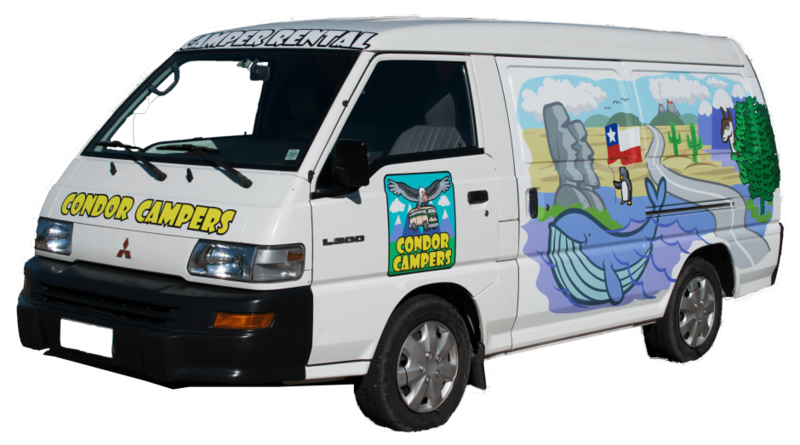 The Condor Explorer is a great little campervan for your Chilean Road Trip. A real road warrior, it will jiggle along the unpaved roads guaranteeing you, and two additional passengers, a safe arrival at your destination for the night. Whether you’re exploring the Atacama Desert, climbing a Volcano or wildlife watching in Patagonia, the Condor Explorer comes fitted with a large pull out comfortable bed where you can rest your weary bodies and ensure you’re all ready for tomorrows adventures. Fully equipped in the back, the Condor Explorer has been specifically designed by our team for easy functionality, providing just what you need for happy camping in South America. The Condor 4×4 Popup is our two person alternative for those really wanting to explore the off road hard to reach sights of Chile and South America. Perfect for the fortune hunter, this tough, compact car will transport you, your passenger and all your camping gear to the distant wonders of Chile. Whether youre admiring the sparkling glacial lakes, Skiing the Andes or tackling the various remote winding tracks, the Condor 4×4 Popup comes fitted with an easy to assemble rooftop tent where you can lay down your head, relax and gaze beneath the glittering star filled sky. Fully equipped with all your camping gear, the Condor 4×4 Popup has been specifically designed by our team to ensure complete shelter when in the wilderness, providing exactly what you need for youre off road route around South America. Perfect for the fortune hunter, this tough, compact car will transport you, your passenger and all your camping gear to the distant wonders of Chile. Whether you’re admiring the sparkling glacial lakes, Skiing the Andes or tackling the various remote winding tracks, the Condor 4×4 Popup comes fitted with an easy to assemble rooftop tent where you can lay down your head, relax and gaze beneath the glittering star filled sky. Fully equipped with all your camping gear, the Condor 4×4 Popup has been specifically designed by our team to ensure complete shelter when in the wilderness, providing exactly what you need for your off road route around South America.